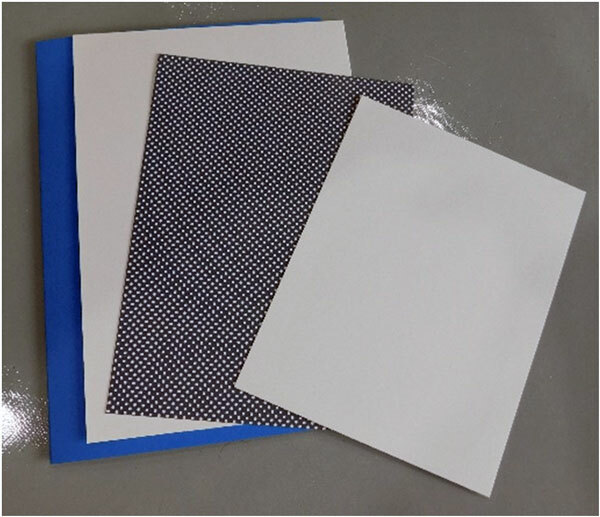 Begin the card by creating the card base from cardstock. The base size can be any sized you would like, but keep in mind that all of the pieces must fit together with the size of the stamp that you are using for the main image. This card is a 5” x 7” base and has been layered with a 4 ¾” x 6 ¾” piece of cardstock and then a 4 ½” x 6” piece of patterned paper. The paper shown is A Perfect Winter from Echo Park. 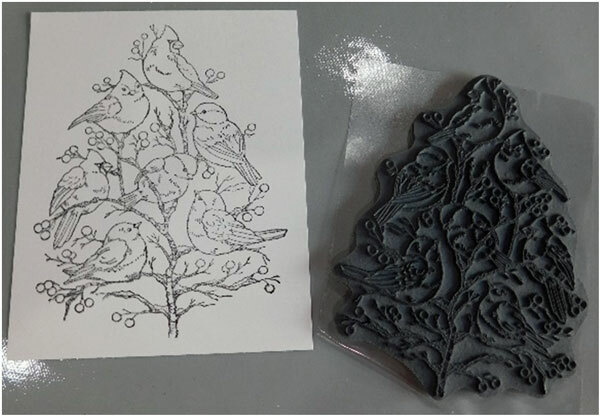 The last piece of cardstock shown is 4 ¼” x 5 ¼” and will be used to stamp the main image on. 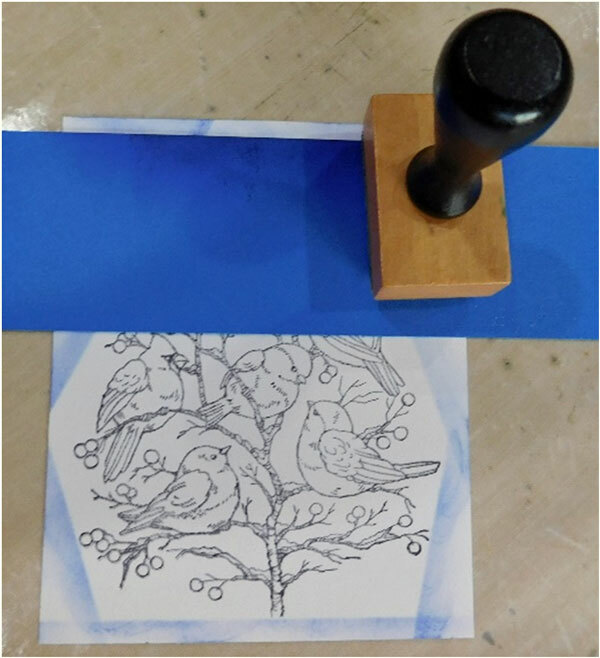 Add ink to the stamp you have chosen to use and stamp it onto the cardstock. 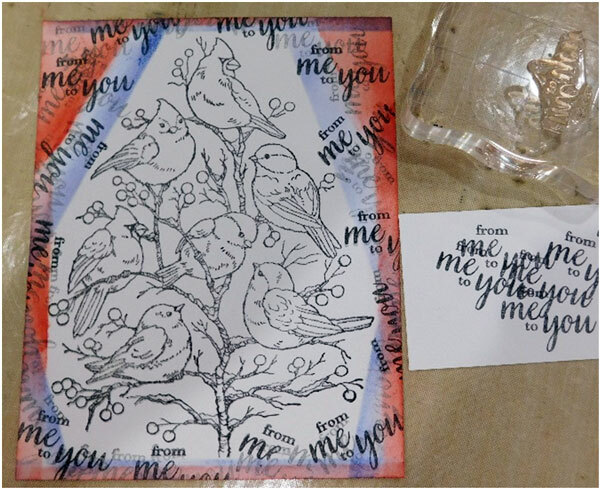 This is the Bird Tree stamp by Stampendous. Using a piece of scrap paper, lay it at an angle on so that it covers the image. Take your blending tool and first ink and begin adding it overlapping the edge of the scrap paper and working outwards towards the edges. Continue to add ink making sure that the darkest part is towards the stamped image. Move the scrap paper around the piece lining it up at different angles and continuing to add the ink. 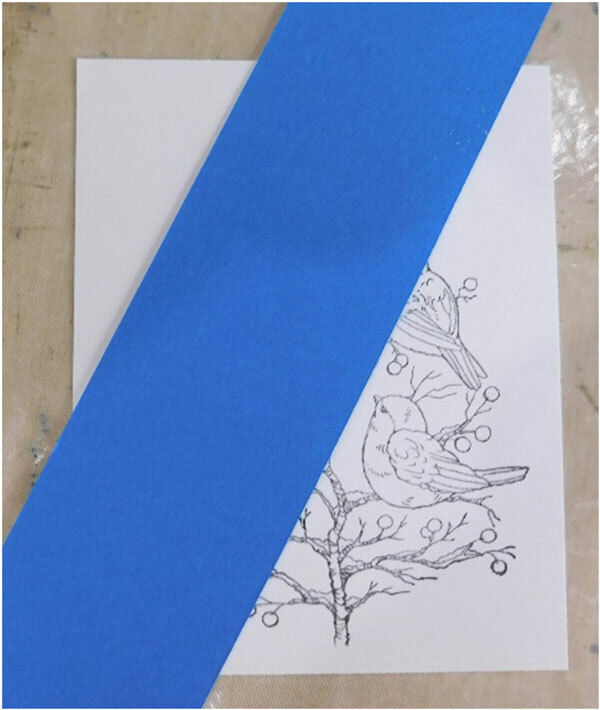 Now, place the scrap paper over the already inked area (the blue here) and instead of working from the scrap paper to the edge reverse this and work from the edge towards the edge of the scrap paper. Repeat this on all sides. Continue to add as many ink colors as you would like making sure to blend each color with the one before it. Now take a sentiment or another image stamp and add ink to it. Stamp off some of the ink onto a scrap sheet of paper and then stamp along the edges where you created the grid pattern. Rotate the stamp so the images are not in all of the same direction. Each time you add ink to the stamp be sure to stamp onto the scrap sheet of paper first. This is known as the stamp off technique. After you have covered the areas using the stamp off technique, go back and add some more, but this time do not stamp off any ink. 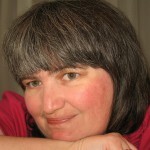 This will create a darker image that will make the background pop. 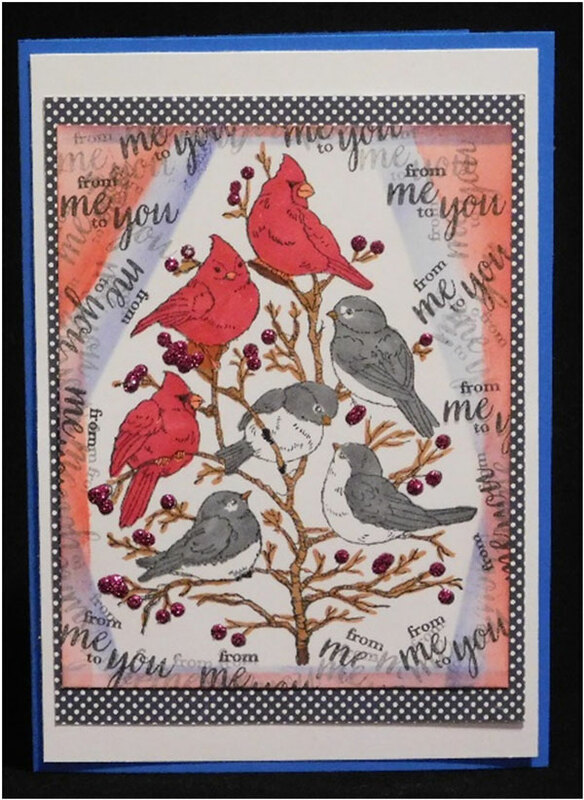 Finish the card by coloring with your favorite markers and adhering each piece together using a tape runner. 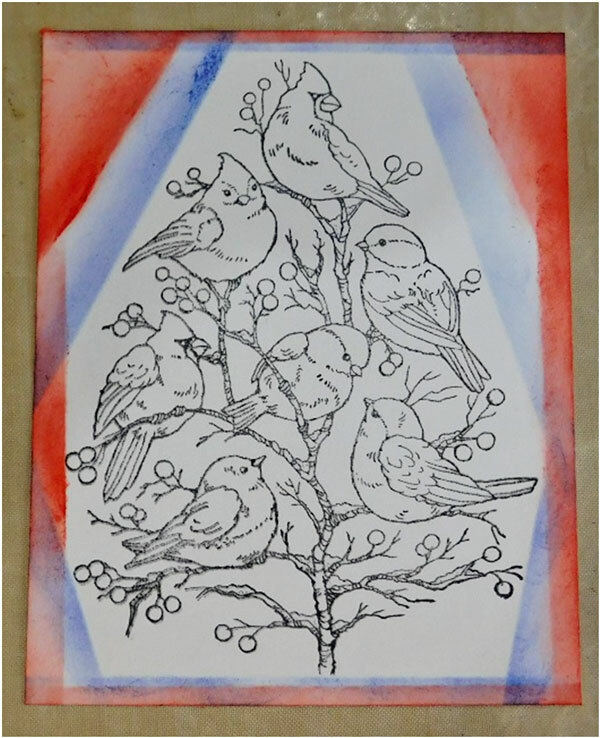 For this card, Stickles were used to add color to the berries on the tree. Whether you’re making a late holiday card, a card to say “thanks” or any other occasion the grid technique is a great way to add color and attention to any stamped image. It’s easy to do for those cards that are needed in a pinch, too. This will be definitely one to add to your list of “go to” techniques for cards year round.